This four-day course has been designed to introduce a variety of perspectives on knowledge management (KM) in the public and private sectors. 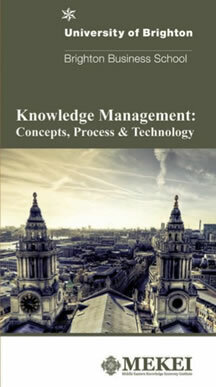 The course aims to enable knowledge managers, analysts and decision makers to introduce fit-for-purpose KM Framework to their organisations. At the end of the course attendees should be able to acquire a comprehensive knowledge and practical experience about KM best-in-class methodology and technology in alignment with the local needs and capabilities. Moreover, after competition of the course, attendees to write a report, supported by the tutor, of what they have learnt and what is particularly relevant to their employers. A focus to be one aspect of the course which has implications for the way they will improve their professional practice when they return to their employers. This will help reassure the employers of the benefits of the programme and help consolidate the understanding of the manager.